Question to fashionista who loves changing hairstyle to suit the trends theme or occasion of the day. Do you headache with your current hair condition which is brittle, dull and unmanageable? Well!! I am!! I am one in the percentage having these problems while also searching for a good hair products who can at least makes my hair feels better than now. If you having damaged hair and you're still looking for a good damaged hair product. Would like to share with you, Dove's latest intense repair range, Dove Intense Repair. 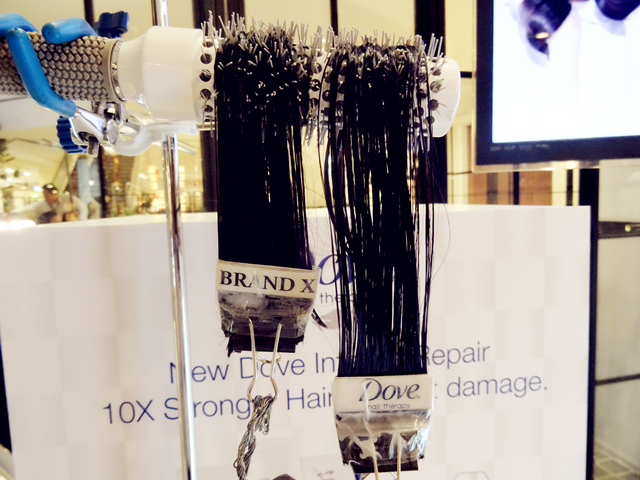 Dove Intense Repair with the new formulated Keratin Repair Activities that goes deep within strands to repair damage. The new improved Dove Intense Repair works at the cellular level of the hair structure and helps reconstruct damaged protein making hair strong and resilient to damage. It also helps to strengthened and protected from further damage for smoother and healthier locks. Other than that, Dove Intense Repair Conditioner now contains the new Microsheets Techonology that helps to coat hair for visible smoothness and shine. These Microsheets are evenly deposited to help detangle hair sot hey are easily combed through almost instantly. 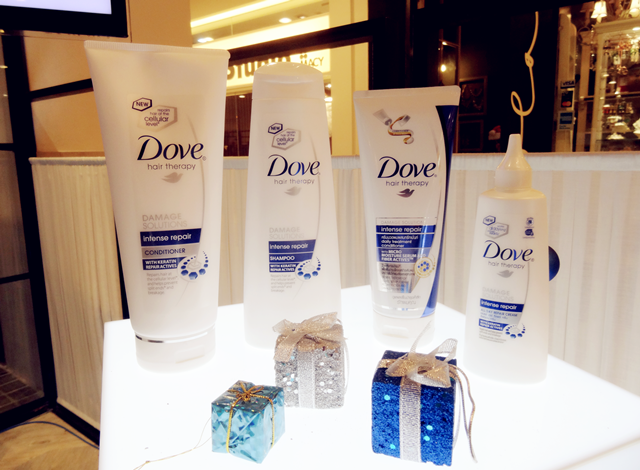 For proven result, Dove has done an experiment by comparing the smoothness between brand X and Dove Intense Repair. Using two parts of human hair and separately apply with different hair products and then wash it by lukewarm water. Lastly, places them on a comb and hangs a magnet on the top. Result proven that, the part of hair that been applied by Dove product was easily fall out fastly while the brand X was still hanging on the comb. Ladies, there no reason to stop experimenting with new looks and new styles. Hair is a completion of women's overall image. A good hair condition or nice hairstyle could makes you looks more confident and stand out. If you're still haven't encounter a good hair product which helps your hair become better. Do give it a try to Dove's latest range, Dove Intense Repair. 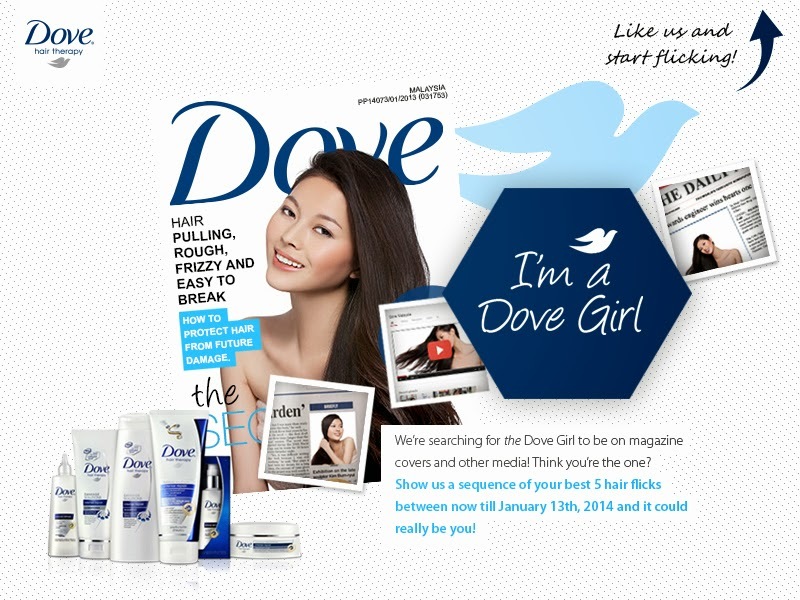 By the way, stands a chance to be Dove Girl and win RM10,000 today!